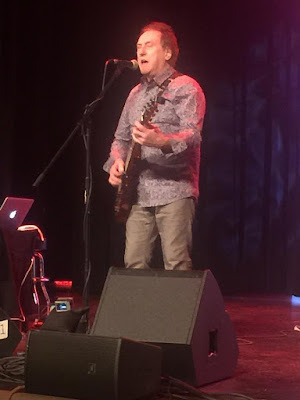 On January 19, 2019 I saw Denny Laine with the "Moody Wings" in concert at the Wildly Theater in Edwardsville, Illinois. This is a little theater that is very close to where I live. Over the past few years more and more bands that I have been interested in have been performing there, so that is nice. After a short break, they came back and did the most amazing thing. Denny and the rest of the band performed the ENTIRE Band on the Run album. They did each song in order with Denny trading off the lead vocals with the other band members for every other song. After playing the entire album, they weren't done yet. A few more Wings songs were performed as well as an encore. It was quite a concert! I really loved hearing Band on the Run in its entirety. That album just flows so well and I was able to hear songs that I thought I would NEVER hear live, such as Mamunia and Bluebird (well I actually heard Paul do Bluebird during the soundcheck in 2013, but still....). But you know what I missed? The female voice. Wings will forever and always be in my mind the harmonies of Linda and Denny. That is what made the Wings sound what it is. Several of the men in the group sang the harmonies that Linda originally did, but it just didn't sound right. It sounded good, but I think it would have been better to actually have a female sing those harmonies. But besides that one little complaint, I really can't think of anything else to say that is negative about this show. It was really a lot of fun. Denny Laine and the Moody Wings are touring all over the United States right now with many more dates. If they come to your area, do yourself a favor and go check out this show! I was hoping to see a review. I live about two blocks from the Wildey, but didn't get to the concert. Saw Roger McGuinn there (twice), and Chris Hillman.